I couldn't possibly be further from Irish, but Happy St. Patrick's Day anyway! 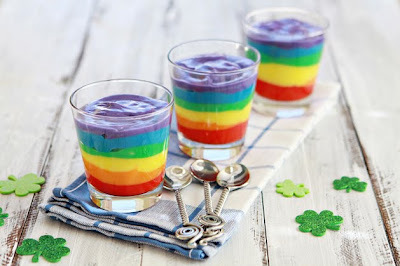 Instead of dragging the Irish holiday (and your dignity) through the mud by getting piss drunk, why not learn how to make rainbow pudding with the kids or share a little tin of shamrocks with your buddies? If anything it sure beats rolling into work with a hangover in the morning. In fact, I work right by where the NYC parade started this morning and people are already passing out and peeing along 6th Ave. Fantastic. Funny thing is... Not all the Irish drink that amount. I mean, the Irish and Welsh definately like their drink... A LOT... But only a handful get in the state people do in order to celebrate along with them. We don't have any fun St. Patrick's Day traditions around here. But I am wearing a very shiny green shirt. What the heck. I love the rainbow pudding! So cute! I'm a bit Irish - but I've learned not to drink at all... I do like seeing green shirts and plastic hats and shamrock button/pins though - I've no idea why really.